Generally when I write I prefer the broad canvas of an 8 ½ by 11 inch unlined page. You can write, draw, or paste in photos or clippings. 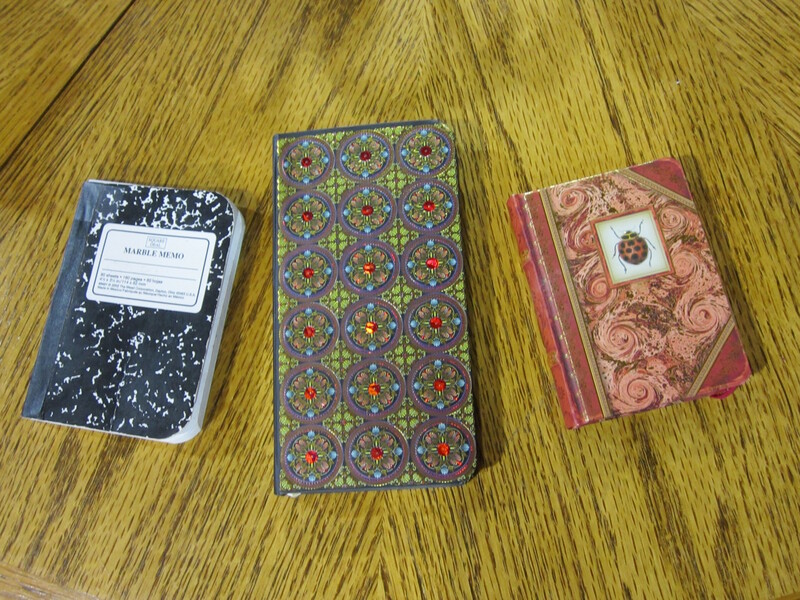 But I find the tiny, “mini journals” irresistibly attractive. While my regular journals are inclusive of all aspects of my life, these mini journals each represent a single microcosm. The notebook with the marbled cover is a gratitude book. As a discipline, I tried to write one thing each day that I was grateful for or admired, one thing that brought joy into my life or that I thought was beautiful. The red book with the ladybug on the cover has been the start of expressing one “haiku” thought on each page, an attempt to learn to say more with fewer words. The gorgeous bejeweled book in the center is the book I chose to record the charming things said by my three year old granddaughter. I will do another book for the other granddaughter as she begins to talk. These mini books are the purest joy to re-read because they filter out the negative. They sit on the table beside my bed. After a difficult day it is uplifting to remind myself of all that is good in my life. I have started giving mini blank books as presents in the hope that others will be encouraged to use them for similar purposes. I do have other tiny notebooks I use to record things like houseplant and garden notes and the work I do in the bee yard. That notebook is covered in propolis (bee glue) and I must write with a pencil. When purchasing these mini books, never buy one that has pages that are bound in with glue. Look for books that are sewn in or all of your pages will fall out over time. That goes for regular journal books, too. It is interesting that many of the antique diaries I have seen, including my great-grandmother’s and great-great-grandmother’s, were so small that the space for each entry could hardly contain one sentence. Just one sentence can still convey a lot. If you don’t believe me, read haiku poetry. You are currently browsing the archives for the the materials of journaling category.